Developed by AIR Music Technology as the ideal scratch pad / music creation kickstart tool to get the ideas flowing the Ignite Music Creation tool is now available. The client offers full support for M-Audio keyboards with additional intrigration features over the normal stand alone mode. Ignite includes over 275 instruments, many of which are taken from our renowned instrument collections – including Strike, Structure, and Velvet. 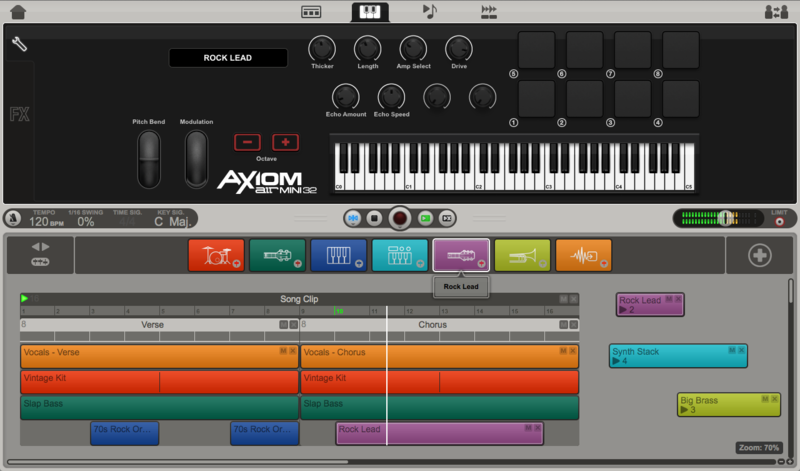 All sounds have been optimized to load quickly, and the editing controls are automatically mapped to your connected M-Audio keyboard. These extraordinary sounds include keyboards, drums, percussion, basses, guitars, synths, strings, brass, and woodwinds. Ignite features Smart MIDI technology to help jump-start your ideas and enhance your music-making skills. The Chord Player generates a chord pattern from a single key, while the Phrase Player can provide a single-voice line to add to your composition. Both the Chord and Phrase player include dozens of patterns in modern music genres – these aren’t canned, boring MIDI patterns. Tailor the performance of these Players by adjusting feel, speed and intensity. The Flexible arpeggiator plays held notes individually, either as a musical flourish or in a rhythmic pattern. Simply connect any current M-Audio keyboard controller to your computer, and Ignite provides seamless integration. The keyboard is automatically detected and controls are automatically mapped when connected to your computer. Adding or changing your keyboard? The controls are automatically updated and mapped. Share your latest creation with friends, fans, and family – or collaborate with other musicians – by taking advantage of direct uploads to SoundCloud. Plus, you can export your individual audio (WAV or MP3) and MIDI files, which can then be imported into any computer-based recording software – including Pro Tools. Capture your ideas quickly and make music – without getting bogged down with technical jargon and complicated steps. Individual musical ideas are captured as phrases and are placed in the Arranger. The Arranger is an organic “stage” where you can organize your music ideas and phrases in whatever way make sense to you. Clips can be any length, and don’t have to be aligned into a pre-determined structure (such as tracks and lanes). Multiple clips can be played back together, or even grouped to create more complex phrases and song sections. Ignite will instantly recognize any current generation M-Audio keyboard controller once it is connected to your computer. Included with Ignite are over 275 remarkable instrument sounds developed by AIR Music Technology. This international team also created the acclaimed Hybrid, Strike, Transfer, Structure, and Velvet instruments for Pro Tools – the industry-standard professional music and audio workstation. Export WAV, MP3 and MIDI files, and import them into any DAW recording software – including Pro Tools.